A 2 year old male presented with relatively larger head size for further evaluation. Previous CT study shows diffuse low attenuating white matter. No hydrocephalus. 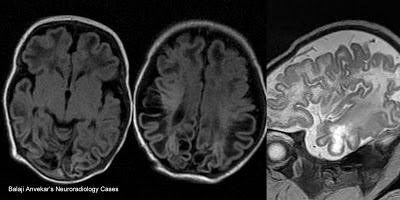 Sub cortical white matter involved early shows cystic areas iso intense to Csf representing white matter paucity in fronto parietal and temporal regions.